Erickson Living announced this week it would repurpose Marriott International’s 775,000 square-feet global headquarters in Bethesda, Maryland, into a continuing care retirement community, once the hotel conglomerate relocates to its new headquarters in downtown Bethesda, in 2022. Marriott broke ground on the 1 million square-foot project last June. Catonsville, Maryland-based Erickson bought the building last December for an undisclosed price. The state values the property at nearly $150 million, according to the Baltimore Sun. Erickson Living will repurpose Marriott International’s headquarters in Bethesda, Maryland into a continuing care retirement community, after the hotel conglomerate moves into its new headquarters. The building is located in the Rock Spring area of Montgomery County, Maryland, and was developed over the years as an office park. The Maryland-National Capital Parks and Planning Commission updated the Rock Spring Master Plan last year to accommodate residential and retail use. The location provides an ideal opportunity to expand Erickson’s Maryland offerings, CEO Alan Butler said in a statement. In a statement to Senior Housing News, Erickson said details on the redevelopment would be disclosed in the coming months. As corporate headquarters relocate, the vacated buildings are becoming attractive redevelopment opportunities for senior housing providers. Epoch Senior Living and National Development are redeveloping GE Capital’s former Stamford, Connecticut headquarters into a retirement community. The redevelopment of the former Motorola Solutions campus in Schaumburg, Illinois will include senior housing, and part of McDonald’s former Oak Brook, Illinois campus could be repurposed as a retirement community. Capitol Seniors Housing began construction on Atria New City, an assisted living and memory care community in the affluent hamlet of New City in Clarkstown, N.Y. The $30 million, three-story, 70,000-square-foot community with 80 residential suites will be operated by Atria Senior Living. Atria New City is scheduled to open in the first quarter of 2020. Eden Prairie, Minnesota-based New Perspective Senior Living broke ground on New Perspective-Franklin, a 180,000 square-foot multi-story senior living community in Franklin, Wisconsin. The development will feature 149 units consisting of independent and assisted living apartments and Betty’s Harbor, a secure neighborhood specifically designed for those with memory loss. Aquara by element, a $88-million aging-in-place seniors residence in downtown Victoria, British Columbia, was granted its development permit this week by the mayor and city council. 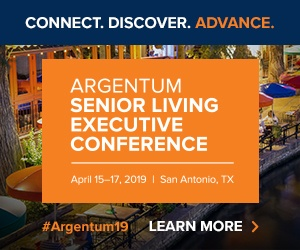 Element Lifestyle Retirement, the manager of development and operations of Aquara, announced that it is launching previews of offerings immediately, and launching pre-sales and rental reservations within the coming months. The residence will be completed in 2021. Mount Laurel, New Jersey-based Brandywine Living announced it will break ground on Brandywine Living at Potomac, a 120-unit senior living community on the site of a former tennis club in Potomac, Maryland. The new community is part of a growing joint venture between Brandywine Living and Toledo, Ohio-based Welltower (NYSE: WELL). The development will accept first move-ins in Spring 2020. Presidium Group, a diversified real estate investment and management firm, broke ground on Artistry at Edgestone, a 188-unit, luxury age-restricted senior living community in Frisco, Texas. When complete in Summer 2020, the community will be the only luxury age-restricted product in Frisco with freestanding independent living cottages that offer community members a heightened sense of privacy and ease the transition of moving from a single-family home. Phoenix Senior Living broke ground on The Retreat at Fishersville, a one-story retirement community with 54 apartments – 32 for assisted living and 22 memory care units. Construction is expected to be completed later this year. Chicago-based Evergreen Real Estate Group announced plans to upgrade and expand Martin Avenue Apartments, a 122-unit affordable senior housing community in Naperville, Illinois. The $38.6 million project will be completed in partnership with the community’s owner, Naperville Elderly Homes. The community currently consists of 81 studio and 41 one-bedroom units that will be improved with all-new bathrooms, flooring, light fixtures and A/C units, as well as upgraded kitchens. Seven of the apartments will be converted to fully accessible units. A new five-story wing – connected to the main building via a one-story link featuring a new bistro and solarium – will add 68 apartments, most of which will feature one-bedroom floor plans. Pear Valley Senior Living opened an 84-unit assisted living and memory care community in Central Point, Oregon. The community is operated by Compass Senior Living and includes a mix of assisted living and memory care. Amenities include a bistro, library, exercise facilities, beauty salon/barber shop, wi-fi, and a theater/media center, laundry facilities, private courtyards and walking paths, and comfortably furnished lounges, activity and living areas for reading, card games, billiards, shuffleboard, socializing and events. Atria Senior Living, Brandywine Living, Capitals Senior Housing, Compass Senior Living, Element Lifestyle Retirement Inc, Erickson Living, Evergreen Real Estate Group, Naperville Elderly Homes, New Perspective Senior Living, Pear Valley Senior Living, Phoenix Senior Living, Presidium Group, Welltower Inc.